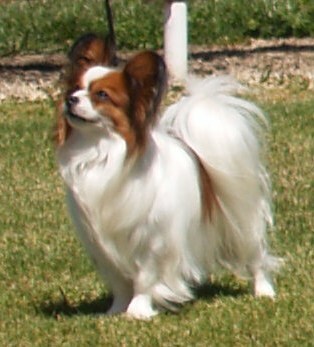 The Papillon was known as a Dwarf Spaniel back in the 16th and 17th centuries and often appeared in paintings sitting on the laps of Spanish and French noblewomen. His ears used to droop but, over a period of time, an erect-type started to develop. The ears were fringed, like butterfly wings. (Papillon is French for butterfly.) 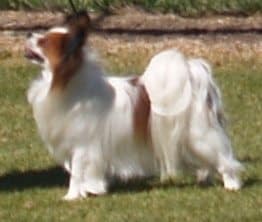 In the US, the drop eared (Phalenes) and erect eared (Papillon) dogs were born in one litter and shown as a single breed. He’s a small, happy dog, with a fine bone structure. He’s energetic, yet dainty and his ears make him stand out from all other breeds. He’s alert but neither aggressive nor shy. He plays well inside and outside. He doesn’t have an undercoat so he only needs occasional brushing. His coat’s colour should be white or parti-white with patches that can be any colour. His height is 8 – 11 inches.